Two books are before me on my writing table: The Life-Changing Magic of Tidying Up, by Marie Kondo and Mess, by Barry Yourgrau. Two drastically different books on decluttering—one, so Zen, and the other, well, messy. I have browsed, pondered, read reviews on each, but haven’t dove into either yet. Instead I seem to be writing my own: a case for baskets. A long time ago in what seems like another life, I lived on St. Thomas USVI and my passion for baskets started there, at The Shipwreck Shop in Charlotte Amalie. Moving from one rental to another, I furnished my homes with straw rugs and tropical trees standing about in baskets, dined on mahogany plates from down island, and donned straw hats as protection from the Caribbean sun. I practically lived out of The Shipwreck Shop and the look has been with me ever since, even now, on San Juan Island in the Puget Sound. Baskets, I have found, pretty much work with any type of décor. Lately, what I like is juxtaposing baskets with the industrial. A winning combination: rustic and industrial. 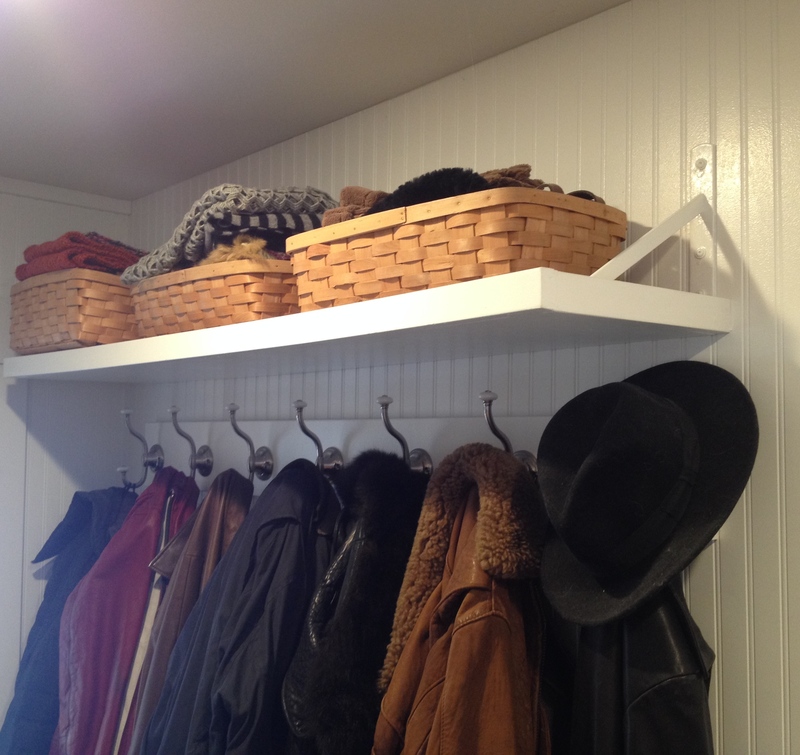 In my house what goes into baskets is extensive: scarves and gloves on an upper shelf in the mud room–called an “Alaska room” in the Pacific Northwest. Hats in a wall-hung basket. Two large baskets contain gifts ready for giving when the occasions roll around. I store stationery, greeting cards, and candles in baskets. Folded dining linens in baskets. In bathrooms, extra hand towels are rolled into a wire basket, and a collection of European soaps in another. The list goes on and on, and with that I need to confess to a few little hoarding habits of my own. Nothing compared to Mr. Yourgrau’s stuff, but still… I “collect,” as I like to call it, “affordable luxuries,” all of which are stored in baskets. Oh, and in the process I collect baskets. “Finders need keepers,” states House Beautiful’s Sensational Storage Solutions. Marie Kondo, the Japanese cleaning consultant and author of The Life-Changing Magic of Tidying Up, would disagree. “A booby trap lies within the term ‘storage,'” she writes. Purging of belongings is Ms. Kondo’s modus operandi. Mr. Yourgrau, on the other hand, author of Mess, accumulated everything of meaning, and if it didn’t have any, he gave it meaning. What began with gathering mementos such as cocktail napkins and coasters from well-loved restaurant experiences around the world, degenerated into hoarding plastic bags and cardboard boxes in his apartment in Queens. It can be a slippery slope. I confess to keeping packing peanuts for reuse as well as folded sheets of bubble packing plastic for the shipping of gifts. I keep them in baskets of course, out in the garage. Mr. Yourgrau lives in NYC and doesn’t have a garage. I don’t know what I’d do there; I would have to change my ways. And seriously, Ms. Kondo, would you send me out for supplies each time I had to ship a gift? Perhaps your family lives within walking distance in Tokyo, but my family is all over the map. Although Mr. Yourgrau has tidied up his place tremendously, his display of miscellany from table to table as seen in “A Hoarder’s Tale of Redemption,” The New York Times August 19, looks to me like Ye Olde Curiousity Shop down on Pier 54 in Seattle. What started on an island for me, a passion for baskets, finds itself on an island once again. All my favorite things, close at hand yet out of sight. Call me a basketcase, but it’s working. Another weekend bobbing about in one of North America’s biggest bathtubs, The Puget Sound. Azure skies, crayola clouds, and snow-capped mountains surround us. Sailboats by the score with their sails in full, and Washington State ferries looking for all the world like Starbucks cups: green and white and hollow. Seals’ heads poking up and dolphin jumping waves with delight. Buoys that have been converted into high-rise bird hotels. We could take up birding on the upper helm of a slow going trawler like this, for we see everything. Much like going for a walk rather than a run. With the crabbing season underway we left every entrée open for the weekend and just packed around it with greens and berries and such. Crackers and wine, leaving the cocktail hour open for crab as well. I wish I could say we always only hope to do better than the year before, but it’s a bit more than that. It is in crabbing that I have had my first experience with compulsive gambling. The season is short and trappers have to hustle right out of the gate. After getting outfitted the first year with a trap, bait, and licenses, and catching a mere two “keepers” (females and undersized crabs are thrown back), we wolfed them down with wine one night at sunset, our eighty dollar apiece appetizers. And that was that for that year. The next crab season a poacher went off with our trap, or it was dragged off by a boat or whatever. In any case it was gone when we went back. So, back to get reoutfitted. I’ve forgotten how many crabs we caught that season, but we were seriously behind in our investment. The third season we purchased a second trap. Another investment made, and a smattering of crabs, most of which had to be thrown back. But we were on a roll, and the cost of each crab began to average better than eighty dollars. Plus we had enough that we could now begin to invite others over. This time, the start of our fourth season, we went out to place the two traps in the water close to shore and one went under and off, buoy and all. One hundred feet of line and it went under, when other traps were all around, their buoys bobbing. One of us thought we had found middle earth or a vortex. The other was sure a seal must have gone off with it, relishing the salmon bait. Both of us were resigned to never seeing that trap again, and I knew I could no longer do the math. But come low tide, when we went back, there it was, back again, not too far from the other one. We feasted that night and the next day on nine large Dungeness crab, with enough left over to make a couple crab cakes. Almost too much at once. I am going to relax about crabbing…. by going fishing. An older, wiser woman I know has the fondest memories of summers spent fishing when she was young. “It’s not about the catch,” she tells me, “but about the time between the bites. The long and quiet moments when it’s just you and the lake. Catching fish actually interrupts that.” That’s what I’m after in fishing. I am not going to calculate a thing and I may not even catch anything. In this I may do well.